This is a vegan recipe for dan dan noodles you won’t be able to stop eating! 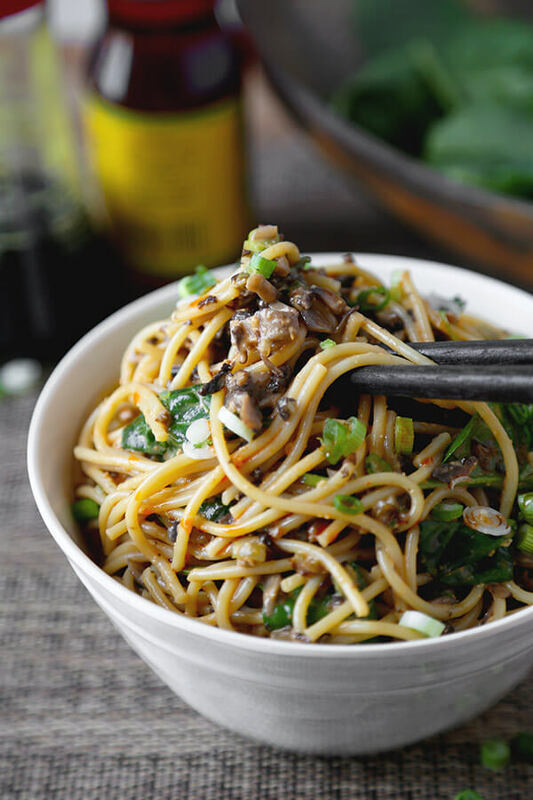 Chopped mushrooms replace the ground meat and bring earthiness to this spicy, nutty and tangy noodle dish. It’s yummy! Sometimes vegan recipes just taste better than recipes with meat. I know, it sounds crazy! But the more I cook vegan dishes, the more I realize that sometimes indeed, certain dishes are just better without meat traditionally used. Well, such is the case with these vegan dan dan noodles! 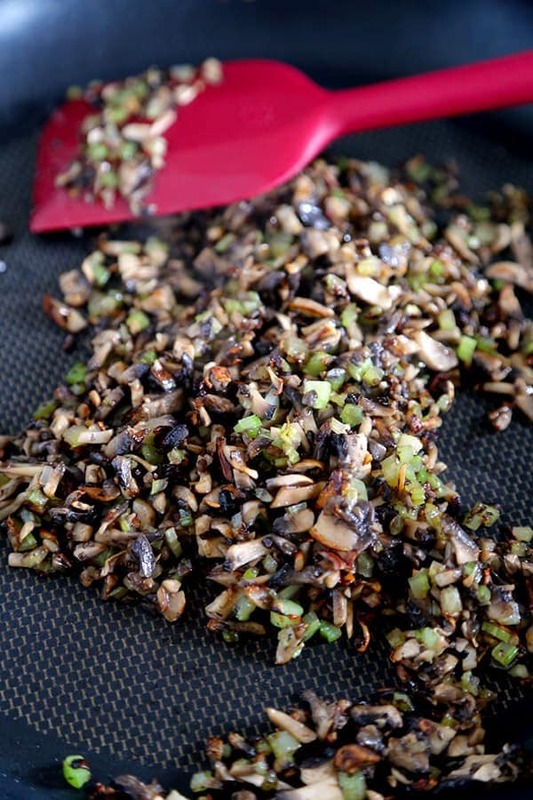 Finely chopped mushrooms replace the ground meat typically used in this dish. They lighten it, give it earthiness and turn this bowl of spicy noodles into a super nutritious meal! You see, mushrooms are packed with goodness. They are high in vitamin D, which is essential for bone health – and also great at boosting the immune system. Mushrooms are also very high in antioxidant properties, which fight against free radicals (that can cause illnesses and create fine lines and wrinkles), and work to protect us against different types of cancers such as prostate, skin, gastric and colon. But aside from all that… mushrooms are absolutely delicious! 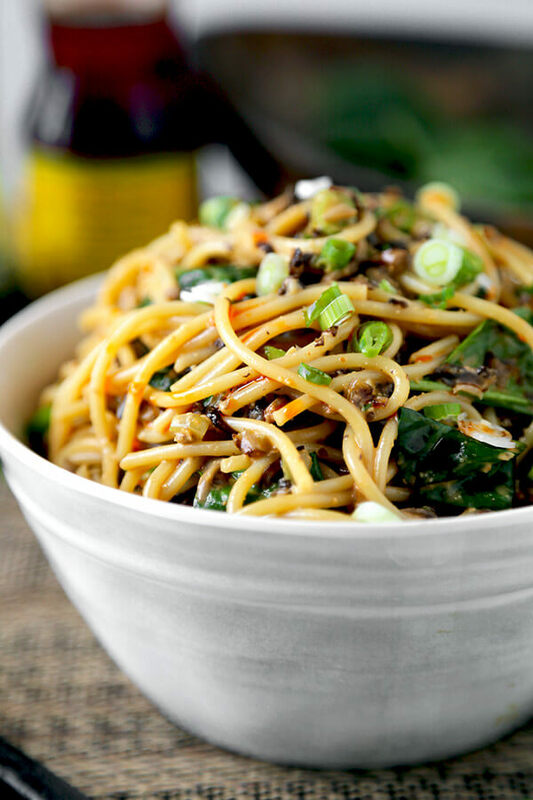 The level of umami they impart to this Szechuan vegan noodle recipe is second to none! Now, traditional Chinese dan dan noodles (担担面) are a mixture of chili oil, ground meat, sauce, leafy greens and noodles. And, while many versions of this dish abound, the one overarching similarity between them is that they’re usually quite spicy! Many recipes will call for the use of Sichuan peppercorns. 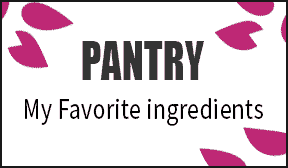 Those are the face numbing peppercorns you’ll also frequently find in recipes like mapo tofu. Well, it’s gotta be said that I’m not a big fan of the mouth numbing qualities of those peppercorns. For me they tend to hijack all other flavors. So I left them out of this mushroom dan dan recipe. That said, if you love it numbingly spicy (I’m looking at you, Ben), then feel free to add them! Also, traditional Sichuan dan dan mien can be served dry or in more soupy preparations. However, for this vegan version, I’m keeping it simple-to-make with a recipe that is more on the dry side of things. You’re absolutely gonna LOVE how easy it is to whip up at home! 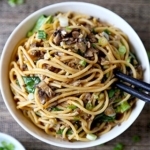 For these vegan dan dan noodles, I’ve mixed finely chopped button mushrooms and celery and stir fried the mixture until tender and almost caramelized. The texture is so similar to ground meat you will find it hard to believe you are actually eating vegetables! Give a quick blend to all the elements for the sauce. I’m using garlic, ginger, rice vinegar, hot chili oil, soy sauce, peanut butter, sugar and salt. 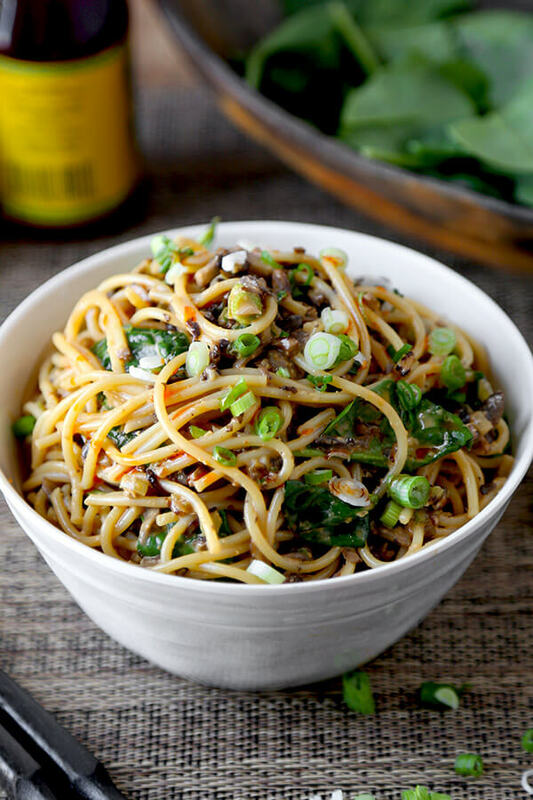 Once your sauce is blended, the noodles are cooked and the mushroom mixture nicely caramelized – just mix everything together in a large bowl. Mixing this warm mixture with a handful of baby spinach makes the leaves wilt just enough that they don’t get soggy or watery. 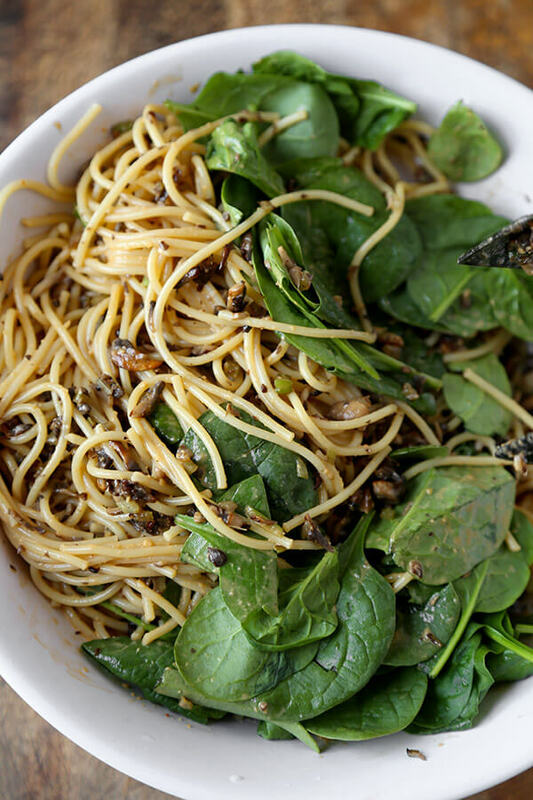 Noodles, mushrooms and spinach are tossed in this nutty, spicy, acidic, sweet and salty sauce to create vegan dan dan noodles that are quite spectacular! Dan dan noodles got their name from the pole that traditional Chinese noodle sellers used to carry when hawking their yummy wares to a hungry populace. You see, a dan dan was a carrying pole that had a container at each end. 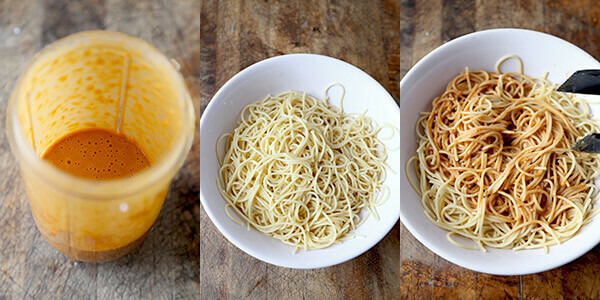 One was a basket of noodles – and the other was a container of sauce. The noodle sellers would hike the pole onto a shoulder, balancing the containers on each end. When someone ordered noodles, they’d serve them up and then move on down the road. Well, it’s not uncommon in food history that the name of a dish is set by the populace that savors it. Sure, pole carried noodles doesn’t have much of a ring to it… But dan dan noodles sounds just right! Now, you may have tried dandanmien on an epic trip to China – or at your favorite neighborhood Chinese spot. But I bet you’ve never tried them with mushrooms instead of meat. 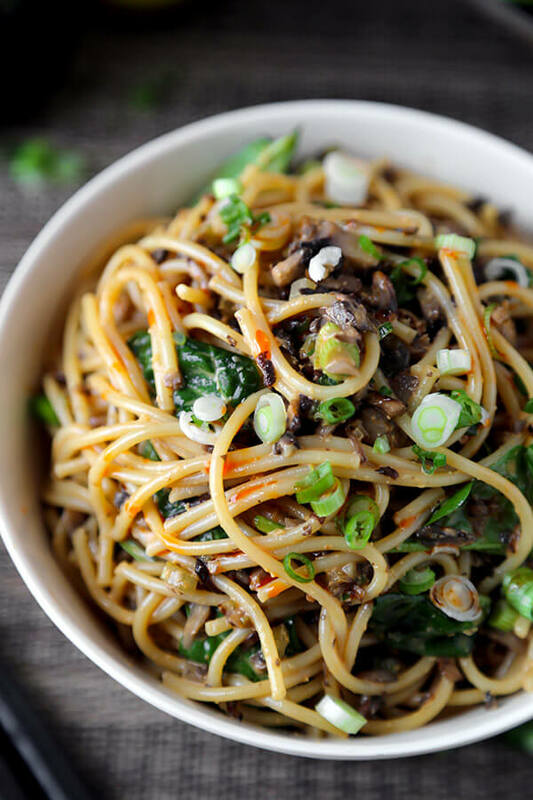 Let me tell you, mushrooms create such a savory, umami flavor and texture in this Chinese noodle recipe – that you won’t miss the meat at all! Serve these vegan dan dan noodles as a main or a side. They taste their best when made fresh but are still delicious cold (after being refrigerated) – or give them zap for a few seconds in the microwave. Did you like this Vegan Dan Dan Noodles Recipe? Are there changes you made that you would like to share? Share your tips and recommendations in the comments section below! This is a vegan recipe for dan dan noodles you won’t be able to stop eating! 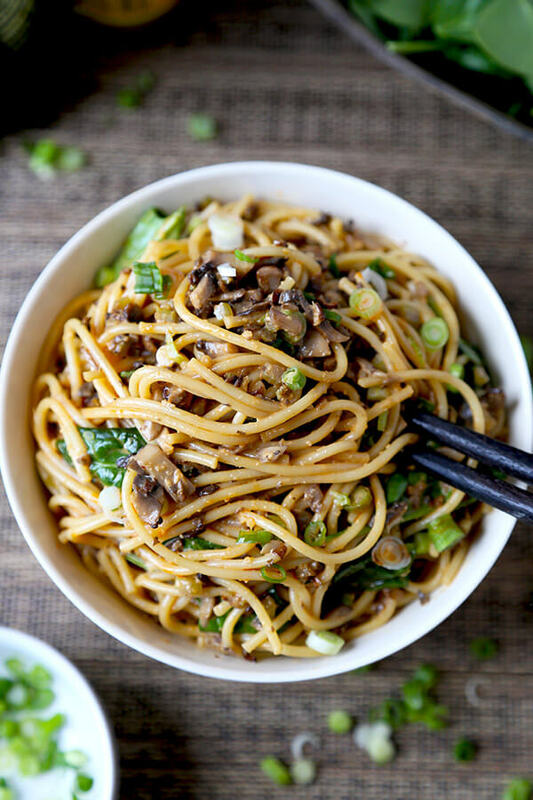 Chopped mushrooms replace the ground meat and bring earthiness to this spicy, nutty and tangy noodle dish. Bring a pot of water to boil. Add spaghetti and cook for 8-9 minutes, until al dente. Drain, rinse under cold water, drain again and transfer to a large mixing bowl. 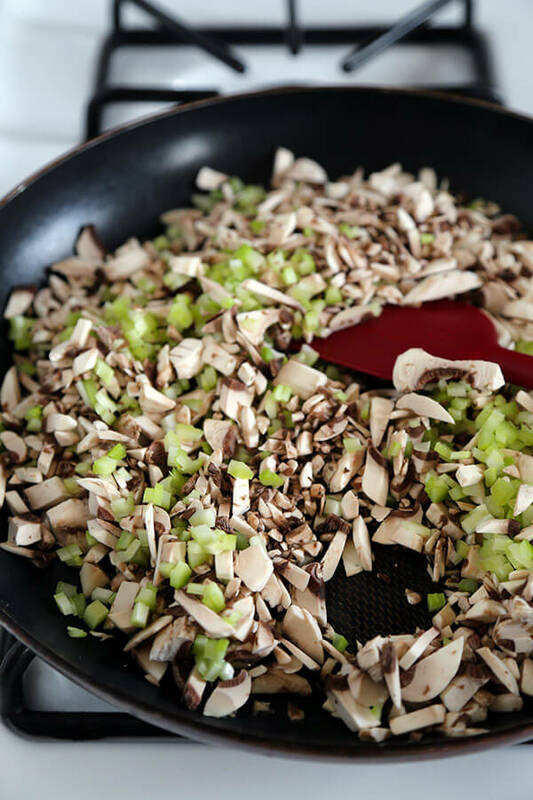 In a pan over high heat, add peanut oil, celery and mushrooms and cook for 8-10 minutes, until mushrooms are beginning to turn a golden brown color. Transfer to a bowl and set aside. Put all the ingredients for the sauce in a blender and blend until smooth. Add sauce to the spaghetti and toss until the noodles are evenly coated. Season with salt until you are satisfied with the taste. Add mushroom mix, spinach and scallions to the noodles and toss well. Serve. This vegan dan dan noodles recipe will keep refrigerated for up to 3 days. This recipe is a huge hit in our house! I only use 1 tablespoon of chili oil otherwise ours lips burn off. The recipe states it served 4 people but we (2 people) usually finish the whole dish as it is so delious. I reduce the sugar & salt as well without noticing a real difference. We like to double the garlic as well. All I can say is YUM! 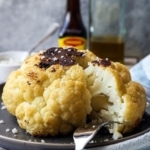 Great recipe – thank you! We made this with only 1 tsp sugar, no added salt, and 1/3 of the oil recommended and it was ABSOLUTELY DELICIOUS! I used aminos instead of soy sauce and didn’t add any extra salt to the recipe and it turned out soooo salty.. don’t know why! That’s so strange Kay, I’m so sorry! I’ve made this so many times and never had trouble with the salt level. Did you salt the pasta water? Cant wait to try this. I see people substituting for the chili oil. Do you think sambal oeleck would be ok or should I do sriracha? I halved the sugar and used a bit of sirracha in place of the chilli oil and we loved this recipe! Thanks so much! I never leave comments on recipe blogs but this is just so good I have to thank you! The sauce is so flavorful! I was a little skeptical because I don’t like typical Thai peanut sauces, but this is a totally different flavor. I didn’t have chile oil so I substituted chili garlic sauce (just added an extra tablespoon). This far exceeded my expectations, so tasty and also quick and easy! This will definitely go on my regular rotation 🙂 Thanks again for sharing this! 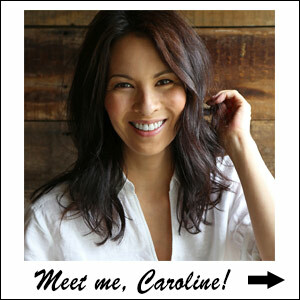 Hi again, Caroline! Writing this after dinner. The noodle dish was a big hit! I used almond butter and the sauce turned out great. Thanks so much for getting back with me promptly because I was hot to try the dish right away! 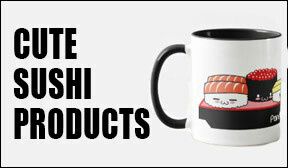 I’ve been browsing around your website and I am so impressed by your work! 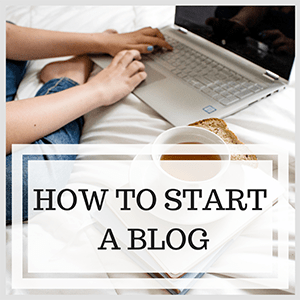 I have a little blog of my own where I will be featuring your recipe next week (without reprinting) and linking to your site 🙂 I will send you a link when it goes live! 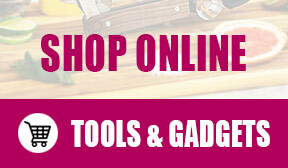 So glad I found your site. I am inspired to raise the bar on my own! 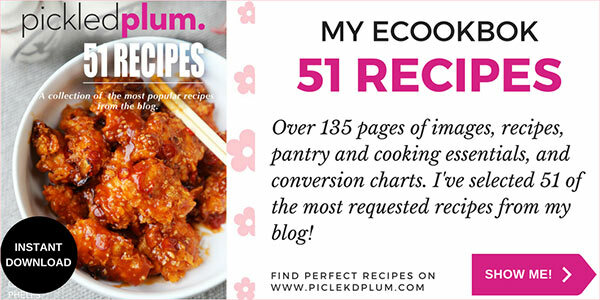 I desperately want to try this recipe but my husband hates peanut butter sauces. Do you think it will work with tahini of almond butter instead? 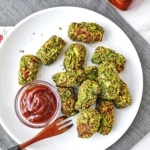 My husband also hates peanut sauces (with a capital H) but loves this recipe! 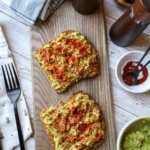 If yours hates the cloyingly sweet peanut sauces used for dipping skewers (like in Indonesian cooking) or for summer rolls (Thai cooking) but loves peanut butter on toast, then you are fine with this recipe since this sauce is completely different and not sweet. This peanut sauce is spicy, acidic and savory and has lots of umami from the soy sauce. If he simply hates peanut butter then you could swap 1 or 2 tablespoons of the peanut butter for almond butter or tahini. Let me know how it turns out! 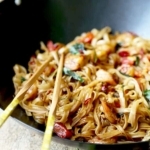 I made these noodles for lunch and they turned out delicious! I didn’t have chili oil, so I used some chili garlic sauce instead. My mushrooms were also iffy, so I used Beyond Beef crumbles in place of them. Overall, good recipe. Thanks for sharing! Just made this for dinner. Halved the recipe and it turned out perfect.. YUM! Will definitely make this again! I really want to try this tonight, but I forgot to buy mushrooms! 🙁 Could I substitute anything? I just made this too and we loved it! Thank you for sharing! Can’t wait to make this it looks amazing! Quick question is it necessary to mince the garlic and ginger if they’re going into the blender anyway? I prefer to do it because the ginger can sometimes come out stringy if it’s throw into the blender in chunks. But that’s up to you, if you haven’t had any bad experiences you can totally do it your way! Wonderful! So glad it did and that your whole family enjoyed it. Thanks for sharing! Love this veganized take!!! It looks and sounds fantastic! Thank you Rebecca! I hope you like it, we LOVE this dish!